The new band seems to be going really well. I can highly recommend the theraputic process of playing cheesy rock with some cool people. We should at this rate be out and giging in 3-4 months. It seems like ages since the last time I was playing live in a pub. At the rehearsal last night I took some photos. Here's a self portrait. Now we just need to decide on a name! So am I. 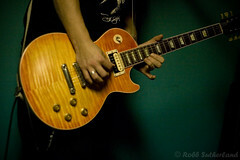 It is the best guitar ever. I just wish the fret board was a bit faster. They are making me play the silly fast solo in the final countdown! Eeeek.